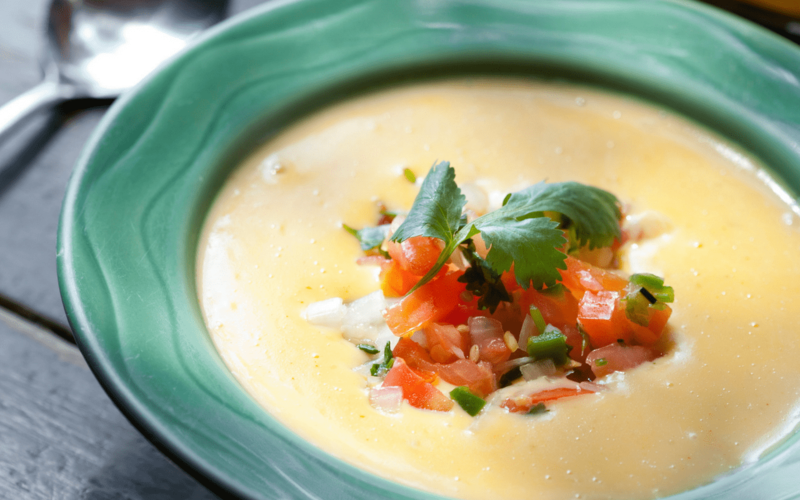 Every day is a good day for chile con queso in Houston. From simple classics to those with kicked-up toppings, there are plenty of essential bowls of liquid sunshine just begging for crispy chips and an ice-cold margarita. That said, satisfying a queso emergency can vary wildly in cost and the more toppings added, the more expensive it gets. So, here’s a list of what diners’ metaphorical pesos will get at 10 Houston-area restaurants. It’s conveniently ordered for you cheapskates — err, “the budget-conscious” — from lowest to highest price per ounce based on the largest size provided, not counting extra costs for optional toppings. If you know a great deal we missed on some quality orange goodness, let us know in the comments. 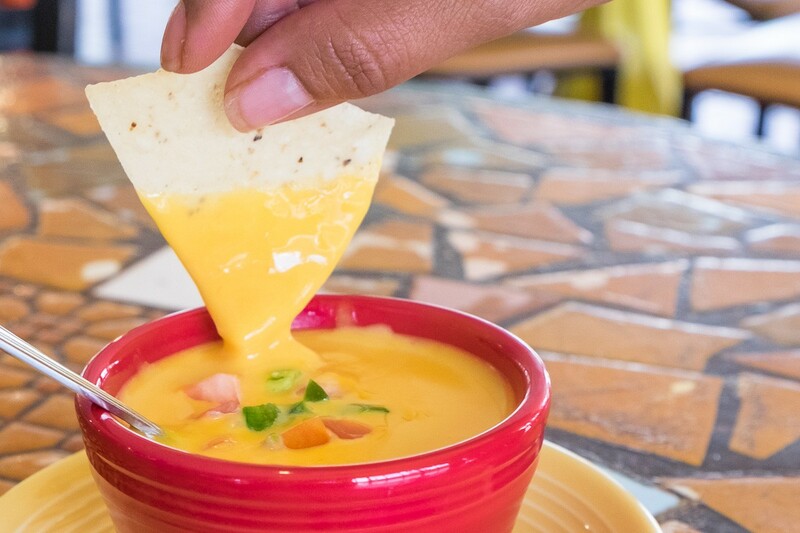 Queso at Spanish Village. Photo by Phaedra Cook. 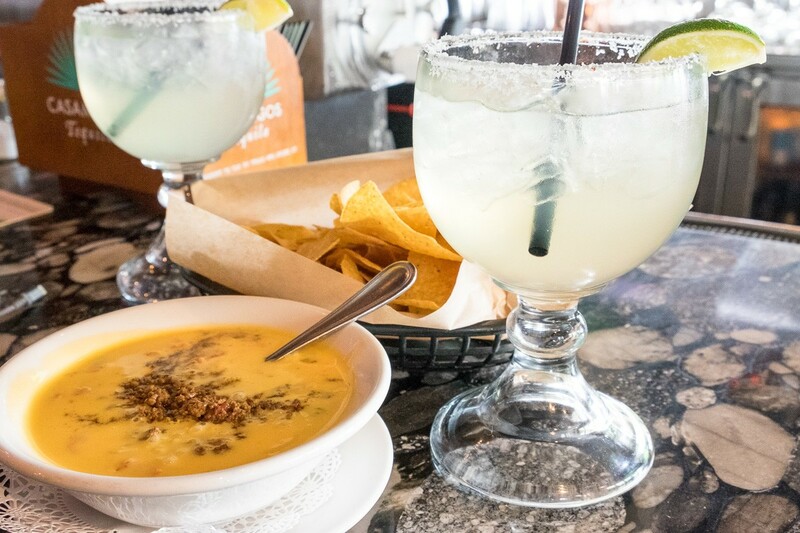 Spanish Village, 4720 Almeda: According to owner Abhi Sreerama, the chile con queso recipe at this historic Third Ward locale has remained the same since the 1950s when the restaurant first opened. (Click to learn more about the restaurant’s long, interesting history and offerings). Fresh onions, peppers and jalapeño are mixed into traditional yellow melting cheese and the whole shebang cooks together as the cheese melts. Water and butter are added for thinning as needed and guests can request fresh or pickled jalapeños and pico de gallo for a few dollars more. Order the $6 eight-ounce small — which comes to 75 cents per ounce — or the $8 16-ounce large, which is the better deal at 50 cents per ounce. Sreerama says most diners actually order the “trio” sampler which includes guacamole, chile con queso and pickled jalapeños. 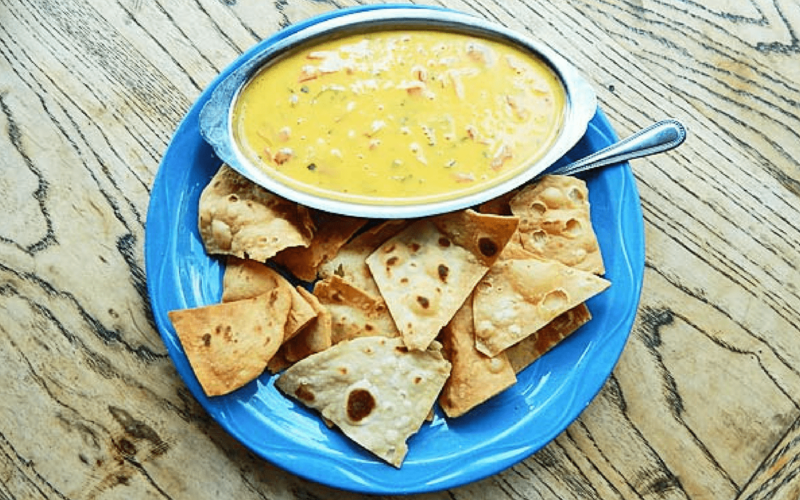 El Real Tex-Mex Cafe, 1201 Westheimer: The Coogs’ Dip at this Montrose mainstay is a blend of white American cheese with a version of Velveeta loosened with whole milk and finished with secret seasoning. It arrives at the table topped with picadillo ground beef, fresh guacamole, pico de gallo and a dollop of sour cream. The 10-ounce small Coogs’ Dip is $5.99, or 60 cents per ounce, and the 16-ounce large costs $9.99, or 62 cents per ounce. Considering that this dip also includes meat, it’s a great deal. Queso with picadillo at Goode Co. Kitchen. Photo by Phaedra Cook. Goode Company Kitchen and Cantina, 9005 Katy Freeway and 8865 Six Pines, The Woodlands: The newest concept from the Goode Company empire, with locations in Memorial and The Woodlands, takes on south of the border flavors and techniques with gusto. The full-bodied cheese dip is a blend of American and sharp cheddar that gets a fresh hit from bell peppers, onions, garlic and pickled jalapeño. Upgrades include picadillo ground beef, onions and tomatoes for $2 and $3, depending on size, or the “Bob Armstrong” version kicked up with pico de gallo, sour cream, ground beef and guacamole for $3 for the small and $4 for the large. Without additions, the six-ounce medium chile con queso costs $7, or $1.17 per ounce, while the 12-ounce large is $9, or 75 cents per ounce. Arnaldo Richard’s Picos, 3601 Kirby: When Arnaldo Richards and his wife first opened in the 1980s, chile con queso was too “Tex-Mex” for Picos’ traditional Mexican menu. Times changed, demand increased, and now the Richards family says, “We can’t live without it.” The result is one of the deepest-flavored variations we found thanks to a combo of roasted tomatoes, roasted Anaheim, serrano and poblano peppers, roasted onions, roasted garlic, cumin, white pepper and a proprietary blend of cheeses. The mix is loosened with crema Mexicana and housemade vegetable stock, making it vegetarian-friendly. Toppers include beef fajita, chicken fajita, picadillo beef, sautéed shrimp, Sinaloa pulled pork, sautéed mushrooms and poblano peppers, and sautéed spinach. Prices vary, so ask when ordering. The chile con queso is available as noted above or as a white chile con queso spiked with habanero peppers. Tied with Goode Company above, Picos’ regular costs $7 for the six-ounce half order, or $1.17 per ounce, and $9 for the 12-ounce large, or 75 cents per ounce. 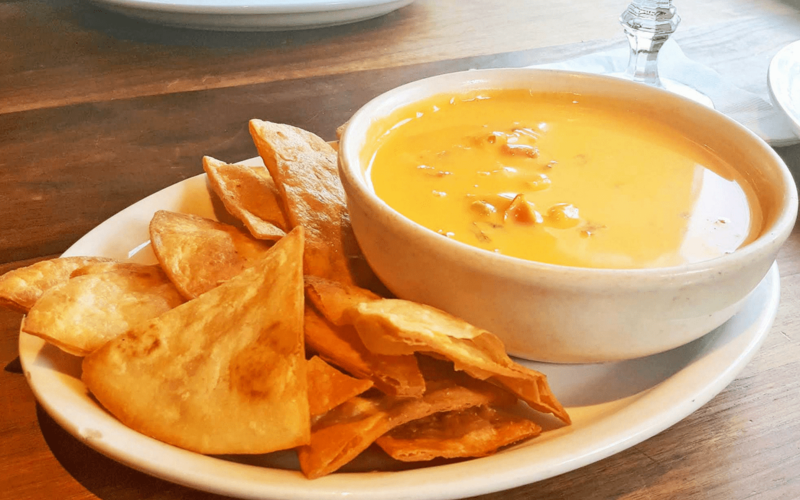 The white chile con queso is slightly higher at $8 for the six-ounce half order, or $1.33 per ounce, and $10 for the 12-ounce large or 83 cents per ounce. 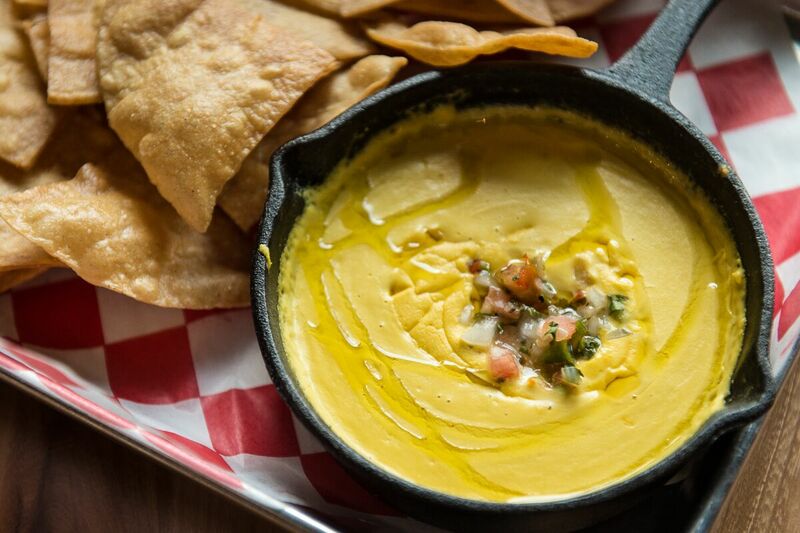 The options here full-fledged — luxurious, even — and sure to satisfy any queso fan’s preferences. Molina’s Cantina, Multiple locations: The Molinas credit Santos Gonzales, who was in the kitchen for 50 years, for creating their chile con queso in the early 1950s. The recipe has remained the same and the spice ratio is so closely guarded co-owner Ricardo Molina says with a laugh, “You can’t even marry into it.” We do know each Molina’s restaurant uses 1200 pounds per month of Kraft-brand Velveeta, which was chosen for its superior melt-factor. The medium four-ounce is $4.95, or $1.24 per ounce, and the large eight-ounce is $7.25, or 91 cents per ounce. 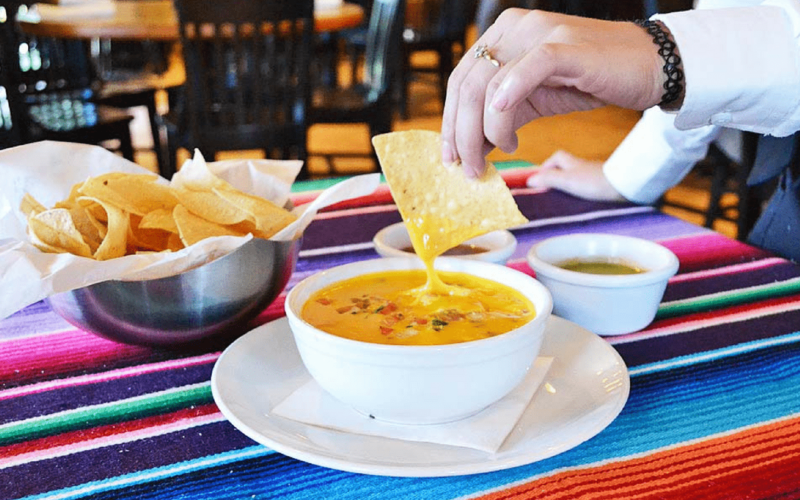 Here’s the real deal, though: sit at the bar during happy hour Monday through Friday from 2 to 7 p.m. for a complimentary order of chile con queso plus free chips and salsa. A spin-off called The Original Jose’s Dip is named for a former server and includes a spoonful of taco meat that gets zip from crushed garlic, ground cumin, black pepper and cayenne powder. It costs $5.95 for the medium and $8.95 for large. 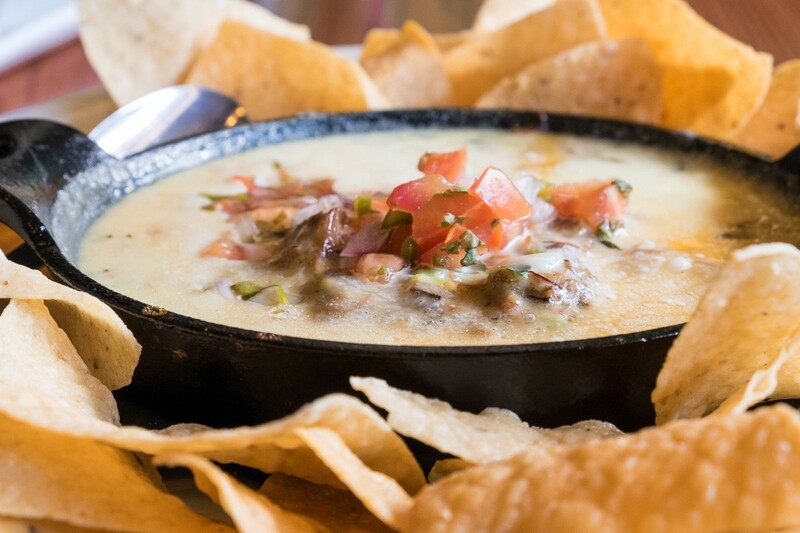 El Tiempo Cantina, multiple locations: Executive chef and owner Domenic Laurenzo melts Velveeta in water then adds pico de gallo, diced celery and diced bell pepper for an addictive cheese classic served all over town. There are four sizes from which to choose: the $2.29 “tiny” is four ounces or 57 cents per ounce (it may be small, but it’s a great deal! ), the $7.79 small is eight ounces or 97 cents per ounce, the 12-ounce medium costs $10.99 or 92 cents per ounce and the $16.79 large is 16 ounces or $1.05 per ounce. 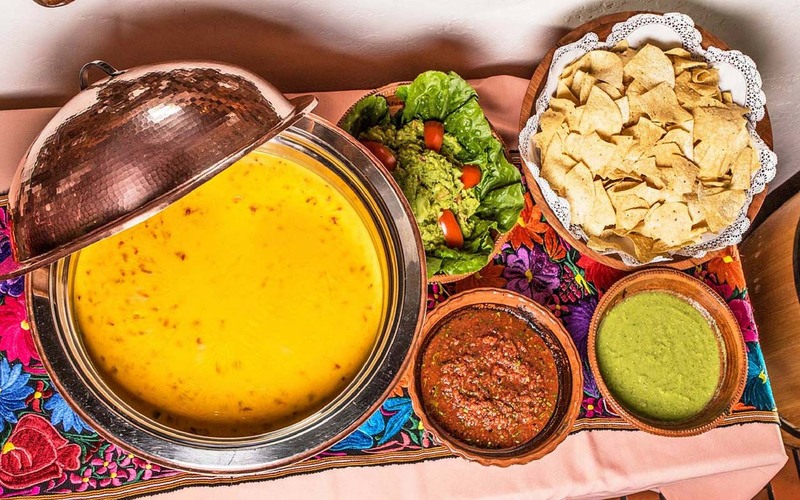 Laurenzo graciously shared his chile con queso recipe so you can prepare his version at home. See the end of this article for this Tex-Mex master’s recipe! Queso and chips at Beaver’s on Westheimer. Photo by Phaedra Cook. 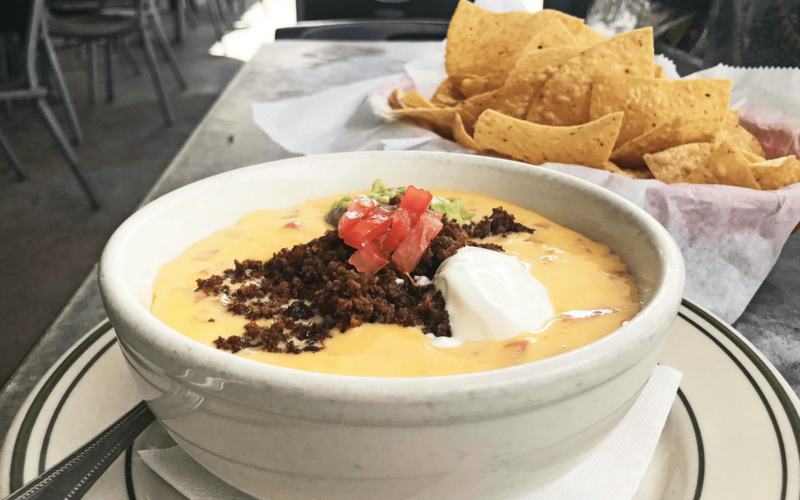 Beaver’s Original, 2310 Decatur and Beaver’s West, 6025 Westheimer: Dining at either laidback location grants diners access to over-the-top Knocked Up Queso but each restaurant has a slight variation. The base is white cheddar, heavy cream, milk and smoked jalapeño and onion. However, the Westheimer version comes topped with chopped, smoked 44 Farms brisket at $15 for 14 ounces, or $1.07 per ounce. The same dish sans the meat is the Smokey Queso which costs $12 for 10 ounces and comes to $1.20 per ounce. 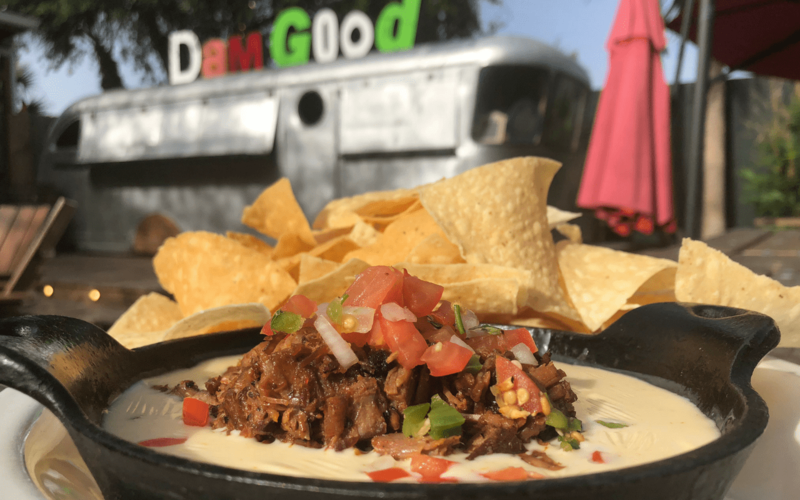 At the original location, chile con queso is $8 for 10 ounces or 80 cents per ounce while its knocked-up version has beef barbacoa and is $11 for 14 ounces, which comes to 79 cents per ounce. The Vegan Queso at Beavers. Photo by Chuck Cook Photography. For a vegan and gluten free “queso”, head to the original for a creation made from poached yellow cauliflower, yellow tomato, garlic, habanero chile, nutritional yeast, water, salt, olive oil and xanthan gum topped with pico de gallo and served with corn tortilla chips. The vegan option is $8 for 10 ounces or 80 cents per ounce. 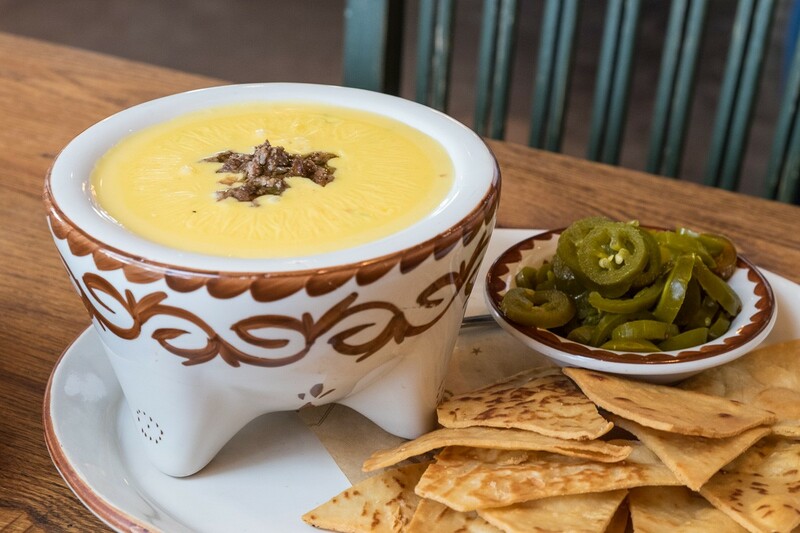 The Original Ninfa’s On Navigation, 2704 Navigation: In Houston’s acclaimed East End Mexican kitchen, chef Alex Padilla calls this classic cheese dip “Liquid Gold” because it’s earned a fiercely loyal fanbase. To make it, Padilla heats milk and cheese in water and, once the cheese is fully melted, adds chopped onions, tomatoes, green bell peppers, cilantro and celery to the pot. He allows the dish to cook for 10 minutes then serves with warm tortilla chips. The resulting seven-ounce bowl of goodness sets guests back $10, or $1.43 per ounce. Queso and margaritas at Cyclone Anaya’s in midtown Houston. Photo by Phaedra Cook. Cyclone Anaya’s Mexican Kitchen, multiple locations: This upscale destination with multiple Houston locations has served the same tried and true recipe for decades. The base, which is vegetarian and gluten-friendly, incorporates yellow cheese, onions, fresh jalapeños, cilantro, chopped garlic and tomatoes. It is loosened with milk to make it more dip-able. Guests can choose from assorted toppings at an extra charge that include ground beef, spinach, fajita beef or chicken, and crab. At $9 for five ounces, or $1.80 per ounce, it is the most expensive option we found. Melt down the Velveeta together with the water over a double boiler, stirring constantly to avoid burning. Once completely melted and mixed thoroughly, add the pico and remaining vegetables, which are optional. Serve with your favorite chips. Note: Laurenzo said for a richer chile con queso, substitute milk for the water. Chicken stock works as well. El Tiempo serves its chile con queso with flour chips instead of corn tortilla chips.